Passive EcoWall provides a complete low energy, diffusion open building concept based on low energy tried and tested, Passivhaus principles, utilising GUTEX woodfibre natural insulation materials, Spano DURELIS VapourBlock certified airtight and vapour controlling racking boards and the pro clima Intelligent Airtightness system. A number of certified Passivhaus houses have already been constructed in Ireland delivering significant reductions in energy use combined with high levels of comfort. A low energy building should not only require minimal energy input to meet the occupant's needs but should also use materials with minimal environmental impact over the lifetime of the building. Passive EcoWall combines a high level of energy efficiency and safety from potential problems associated with condensation risk and moisture penetration, with minimum embodied energy, and high levels of comfort and health, using natural renewable materials with a significantly reduced carbon footprint. 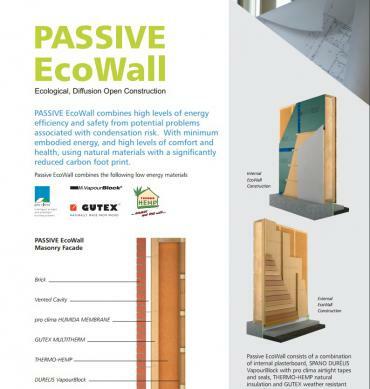 Passive EcoWall provides a more durable, ecological alternative to conventional construction methods. Passive EcoWall offers a proven combination of natural materials and high-performance airtightness solutions which may be applied in timber frame construction or conventional masonry construction. The concept provides a truly breathable structure. It incorporates an innovative internal structural board, DURELIS VapourBlock, which is pre-fitted with a vapour control and air barrier layer. This, in turn, increases efficiency on site, reduces installation costs and provides a continuous internal airtight seal for the construction, while reducing the risk of interstitial condensation. As structural elements are sealed more than ever for airtightness, moisture management is essential, particularly in our damp climate. Unlike many conventional wall systems, Passive EcoWall incorporates an external insulation layer, GUTEX woodfibre boards, which are extremely vapour diffusion open, This allows structural elements to dry out rapidly and completely. In this way, condensation risk is dramatically reduced. Passive EcoWall combines low energy construction with more sustainable building materials with minimal risk of moisture induced structural and health problems over the life of the building. Further detailed specification data and a range of U value's assessments for Passive Eco Wall may be downloaded from. Please Click below.